Divinity: Original Sin part 2 – Updated My Journal. 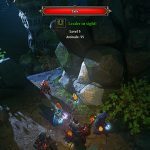 As Source users, the heroes of Divinity: Original sin can talk to animals, and there are several quests that involve the help of man’s best friends. In your version of the game, using a unique personalized unlock code, one animal will carry the name of your choosing! We can customize the animal’s visuals to a certain extent, and we will accommodate if possible.